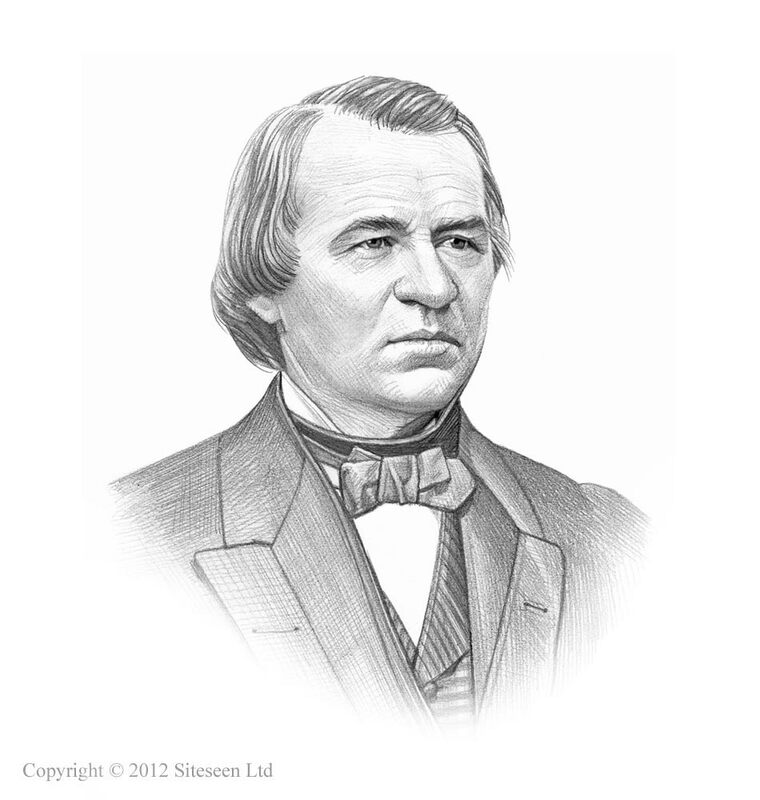 Carpetbaggers: Andrew Johnson was the 17th American President who served in office from April 15, 1865 to March 4, 1869. This article provides facts and information about the Carpetbaggers during the Reconstruction Era following the Civil War. Summary and definition: Carpetbaggers was the highly derisive name given to Northerners who went South after the fall of the Confederate States of America (CSA) seeking personal, financial gain or political advancement during the Reconstruction Era following the American Civil War (April 12, 1861 – May 10, 1865). The end of the bitter and destructive Civil War led to the Reconstruction Era which lasted from 1865-1877. The old South was humiliated and defeated. During the Reconstruction Era the South was occupied by United States Federal troops. New state governments and economies had to be established in the South. The infrastructure of the South had to be rebuilt. Life in the South was turned on its head. Power in politics was controlled by Republicans from the North as opposed to the Democrats of the South. It was a time for great change and for many it was a time for exploitation. Unscrupulous Northerners headed South looking to exploit opportunities for financial gain and personal power - they were referred to as the 'Carpetbaggers'. Why were Carpetbaggers called Carpetbaggers? How did Carpetbaggers get their name? The name is based on the image of opportunist "Yankees" arriving from the North with all their goods thrown together in a big carpetbag. A carpetbag was a common type of travelers bag, made out of scraps of carpet. The carpetbaggers were quick to move - ready to pillage and plunder the defeated South. What was the purpose of the Carpetbaggers? The name 'Carpetbaggers' was therefore a highly derisive name given to Northerners who went South after the fall of the Confederate States of America (CSA). Their purpose was to seek personal financial gain or political advancement. The Carpetbaggers were looking for money or power. What is the Difference between Carpetbaggers and Scalawags? The Carpetbaggers came from the North to exploit the troubles of the South. The Scalawags were native to the South. The Scalawags turned on their own kind and were deemed as traitors to the South, cooperating with the Republicans for the same reasons as the Carpetbaggers - to get rich by exploiting Southerners or gaining power through political advancement. Both the alien Carpetbaggers and the renegade Scalawags had the same objectives during the Reconstruction era. The Carpetbaggers looking to make money took advantage of the plight of the Southerners. The Civil War had taken its toll on the people of the South. They had been defeated and humiliated. Land had been destroyed during the "scorched earth" policies adopted by General William T. Sherman and homes had been damaged. The Union Blockade prevented the Southern farmers from selling their goods - cotton exports, fell to 2% of their pre-war volume. The Confederate States of America had been forced to raise money to finance the war by borrowing from its citizens. Confederate bonds were given in exchange for money. The Confederate government issued over $150 million in Confederate bonds, none of which was ever repaid. The CSA also printed about $1 billion dollars which was not backed by gold which led to massive inflation and high prices. By the end of the Civil War Confederate dollars were worth about $.05 in gold, the South was economically devastated and many Southerners were ruined. What did the Carpetbaggers do? The Carpetbaggers who were looking to make money took advantage of the economic plight of the Southerners. In order to finance the re-building of the South and its infrastructure the state governments raised property tax rates. In some places, the property tax rate increased ten-fold. The Southerners had no money to pay the taxes. The new tax system had been designed to force owners of large plantations and lands to either sell their property or have it confiscated for failure to pay taxes. The Carpetbaggers were able to buy property, businesses and lands at rock-bottom, bargain prices. Other money-making Carpetbaggers invested in re-building programs, including the highly lucrative railroads. Cheap labor was made available by the Vagrancy Laws and Convict Leasing. What did the Carpetbaggers do? The Carpetbaggers looking to gain political power were provided with ample opportunity following the changes to Southern state government during the Reconstruction Era. Southerners had attempted to restore self-rule, the Black Codes were passed and only white people were allowed to vote or to participate in the framing of the new state governments and constitutions. Congress intervened and new constitutional conventions were held in 1867 and 1868. Black adult males were given the right to vote, run for public office and participate in the new state governments. The ex-slave vote, consisting of 4 million in the South, provided the means to acquire political power. Traditionally members of Congress and the State legislatures would invariably reside in the district which they represent. Former Confederate leaders and military personnel were banned from both voting and holding political office in the South. The Republican Political Carpetbaggers moved to the South with the prospect of gaining power through the black vote. The term 'carpetbagger' was to become synonymous with any outsider who meddles in an area's political affairs for his own benefit. Corruption soon followed the Carpetbaggers. Rumors were spread among freedmen that the federal government was going to grant “40 acres and a mule” to every ex-slave family. The Freedmen became the allies of the political Carpetbaggers. Once elected to office the political Carpetbaggers had the power to pass new laws and to grant contracts for the re-building of the South. How did Carpetbaggers affect Reconstruction?